It never fails that once I finally get into relaxation mode (meaning, the school-related dreams have ended and traveling for the holidays is mostly over), my immune system takes a break and I get sick. It's nothing major, but I've had headaches from the minute I wake up that last all day, I've been really lethargic, and my throat has been hurting. I haven't been running because my energy level is just shot. But I have been doing some other workouts that I thought would be easier - meaning, no bouncing that will hurt my head. Not easy, because they definitely aren't! The first is this workout from Blogilates that Helly linked on her blog a couple weeks ago. I thought this looked "easy" and about two minutes into it was like OMG NO. I didn't feel sore immediately after (I did during), but DOMS set in the next day and I'm still walking like a robot. My original plan was to do the 30 day challenge after the marathon (and put running on the back burner for awhile), so I've been doing these fairly diligently. I like that they're quick and seem easy, but then you really start to feel them after a couple days. And honestly, I do think I'm seeing results pretty quickly, too. On the relaxation front, I decided to undertake the task of watching all six Star Wars movies before we went to see The Force Awakens. I've never seen them before! 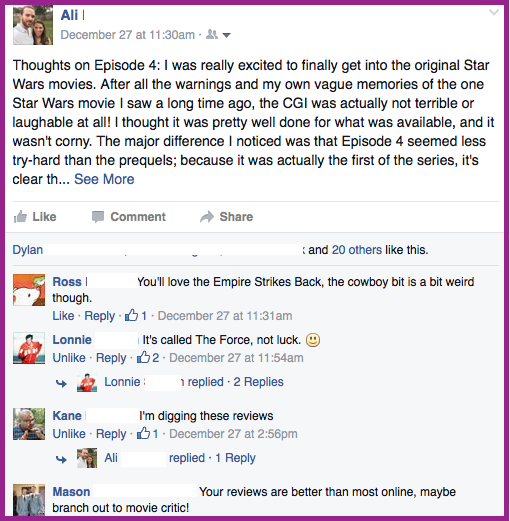 We watched all six over break and I wrote reviews/reactions on Facebook, which ended up being pretty fun. I liked being able to discuss such culturally significant movies with my friends who are big fans; it was funny to see how many people told me to "just enjoy them." Like, the entire point of my watching them was to analyze, react, and review! #EnglishMajorProblems, right? 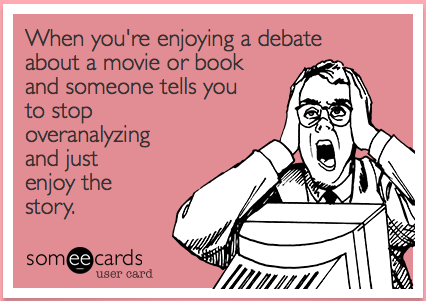 I keep trying to tell people that analyzing movies is how I enjoy them! I have a ton of work-related stuff I need to get done before school starts again Monday. Midterms are the week we get back, so I need to get mine printed and copied. I have a PD I need to write and prepare for that week, too, and I still have tons of grading to finish. But I'm glad I took the first week of break to just relax and enjoy time with family and friends. Sometimes we all need that mental break in order to come back sharp and be able to continue doing our jobs to the best of our ability. Teachers especially, since we work with kids and need to be compassionate and patient at work, need this time to just veg out. Have you seen the Star Wars movies? When you take a break from running, what kinds of workouts do you do? Have you ever tried Blogilates? These year end posts are always a little daunting, but they're hardest when I'm not really ready to say goodbye to the year. This time, I feel ready. 2015 was fine, but it wasn't a highlight year for me. 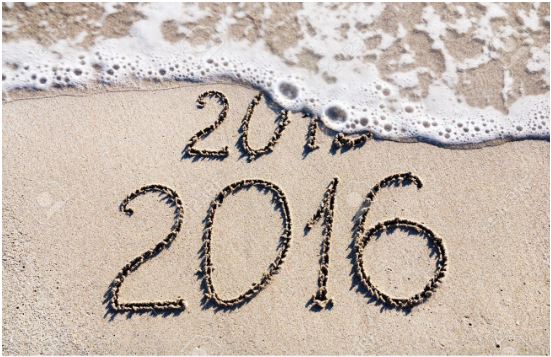 I've been looking forward to 2016 for months now...so it's definitely time to bid 2015 adieu. This year I ran twelve races, including my second full marathon and multiple "distance challenges" (Gasparilla and the virtual Runner's World Festival hat trick). What I lacked in speed, I made up for in mental strength and stamina. I pushed myself to new limits this year, and came away better for it. Highlight: January marked my 5 year runniversary, which felt like a pretty big deal. Noteworthy Post: I dug through old photos and data and found information about my first-ever race, a small, church-organized 5k that I ran without expectations and just for the cause. It's interesting to see how much things have changed for me since then, at least where racing is involved. Highlight: Running a colleague's first 5k with her - it was extremely emotional and wonderful to see her finish. I'll never forget experiencing that with her. A close second would be Gasparilla Weekend with Kristin and Mari. 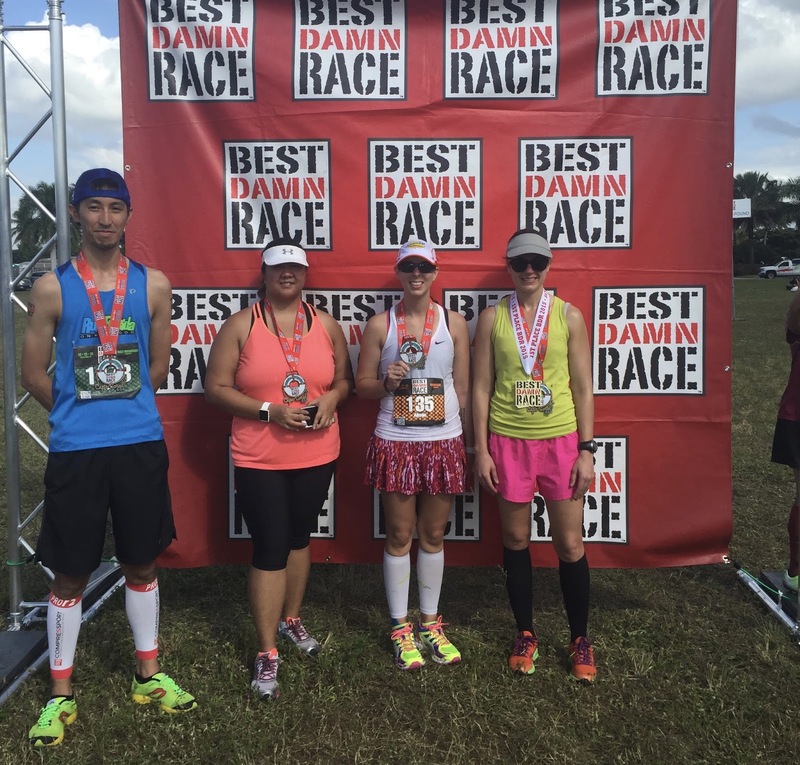 The distance challenge and back-to-back races were difficult, but made me feel like Superwoman! 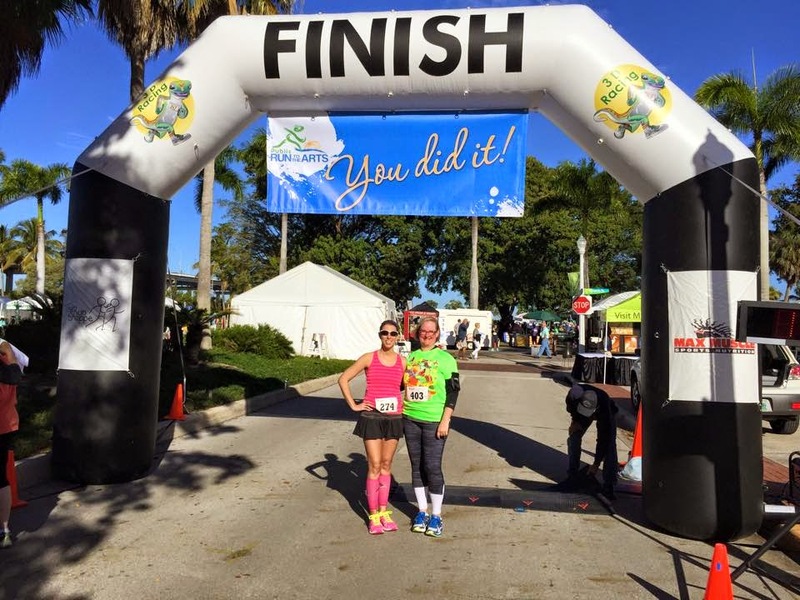 Noteworthy Post: My recap of the A1A half marathon. I don't think I've ever felt happier at a race than I did that weekend. Highlight: Getting to play volleyball on a faculty team against other schools in our network. I really need to consider joining a league, because I miss it! Noteworthy Post: My slightly snarky post on reasons I won't follow certain blogs still makes me laugh, and still rings true. 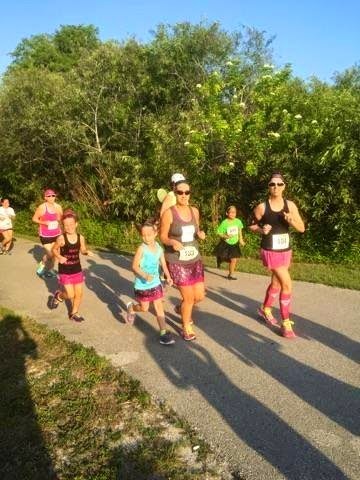 Highlight: Running with Kristin and her daughter and Meg and her step-daughter in the Girls on the Run 5k. Being out there just for fun and seeing all those active kids was so fulfilling! Noteworthy Post: Remember that time a drunk teenage couple parked their car in our driveway and we had it towed? Ah, good times, good times. Highlight: My annual trip to DC with my students was definitely a highlight, as was seeing my oldest friend get married. Noteworthy Post: This one's a tie between my thoughts on word choice and things you'll find in a runner's mouth. I had forgotten I ran to Celine Dion this spring and wasn't ashamed to admit it! Highlight: I received a Teacher of the Year Award, which was humbling and surprising, and I got to see some of my fellow All-Star Teachers in Tampa! It was a good month to be a teacher. Noteworthy Post: I'd been debating posting about my favorite picture ever since it was taken, and June 2015 I finally did. I'm glad, too. Everyone was so supportive and I hope my story spoke to others. It was a scary post to make public, but I feel a lot freer and stronger since doing so. Highlight: Traveling to St. Croix to see Scott and help him move in was a nice summer trip to celebrate Matt's and my anniversary. 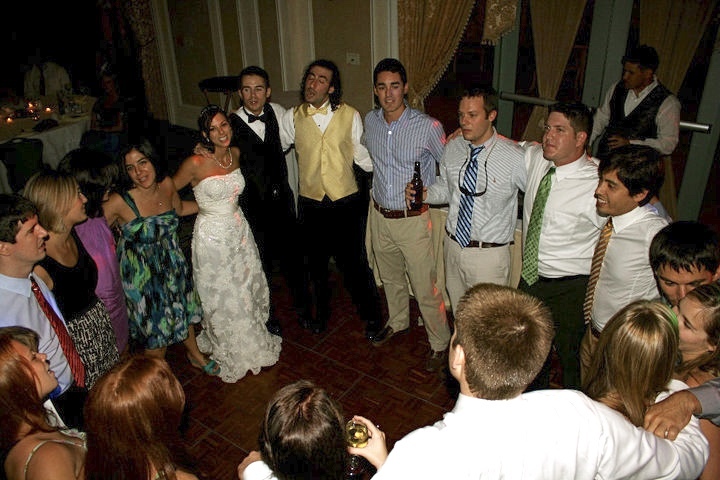 Noteworthy Post: Matt and I celebrated our five year anniversary, and it was a nice excuse to look back on how young we looked and how pretty our wedding was! Highlight: I found gluten free Cheerios at my grocery store! I know, it seems like such a silly thing, but there's no accounting for what makes us happy! Noteworthy Post: My response to things non-runners say, because very few of us were just born runners from day one, and we've all been there. Highlight: I'd like to pretend this month never happened. Honestly, there were no highlights, and the entire month I was depressed and moody and completely emotionally absent...And looking back at my blog archives for September brings back the pain of Archie's death as if it only just happened. This month sucked. 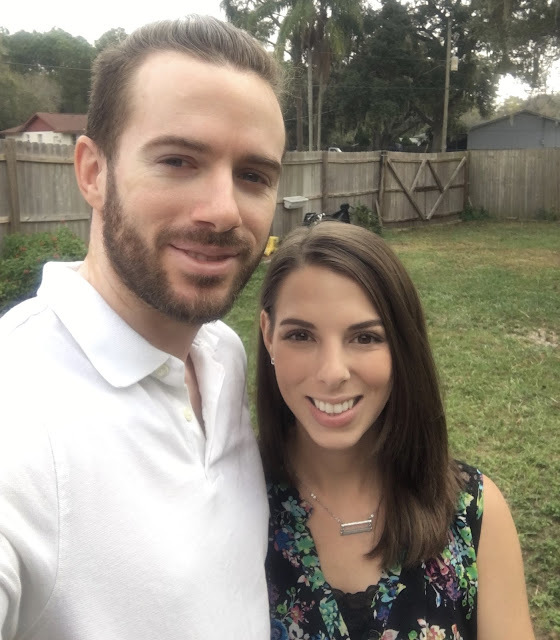 Noteworthy Post: Matt answered questions about my running, and he did a pretty good job! 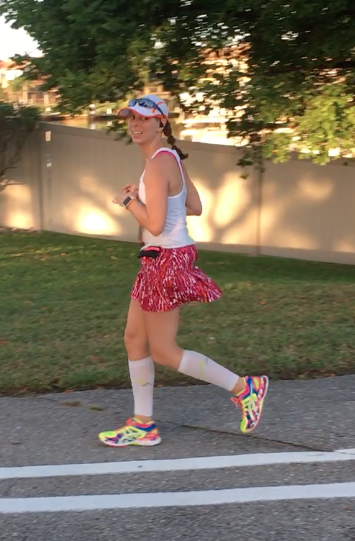 Highlight: I hit 100 miles in a single month for the first time ever, and I was stoked! I ran my longest solo long-run to date, and Matt had Chattajack, which was a crazy adventure and a definite highlight for both of us, and my little sis got married. Talk about a full, good month! Noteworthy Post: I let you guys see a little bit behind the scenes of what I'm really like in real life. Now that Megan and Kristina have seen my home and spent some quality time with me, they can verify if these things are true! 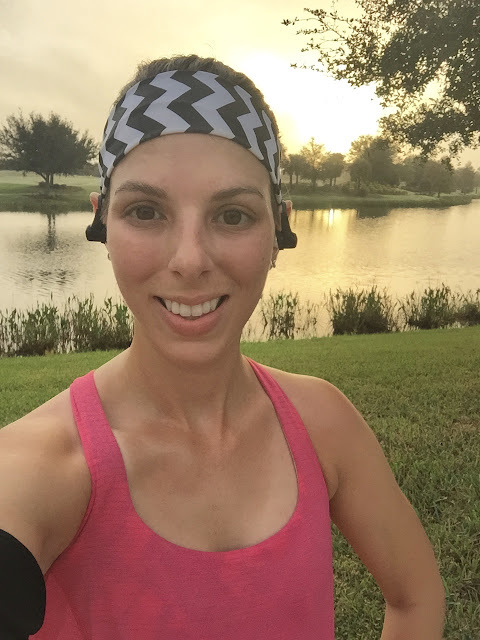 Highlight: I hit another mileage milestone - running 20 miles totally solo. This was definitely a strong training year! Noteworthy Post: Despite not meeting my goals for BDR, I still stand behind the determination and self-assurance in this post. Highlight: Running BDR...mostly because I got to spend quality time with my sister and two of my favorite bloggers. 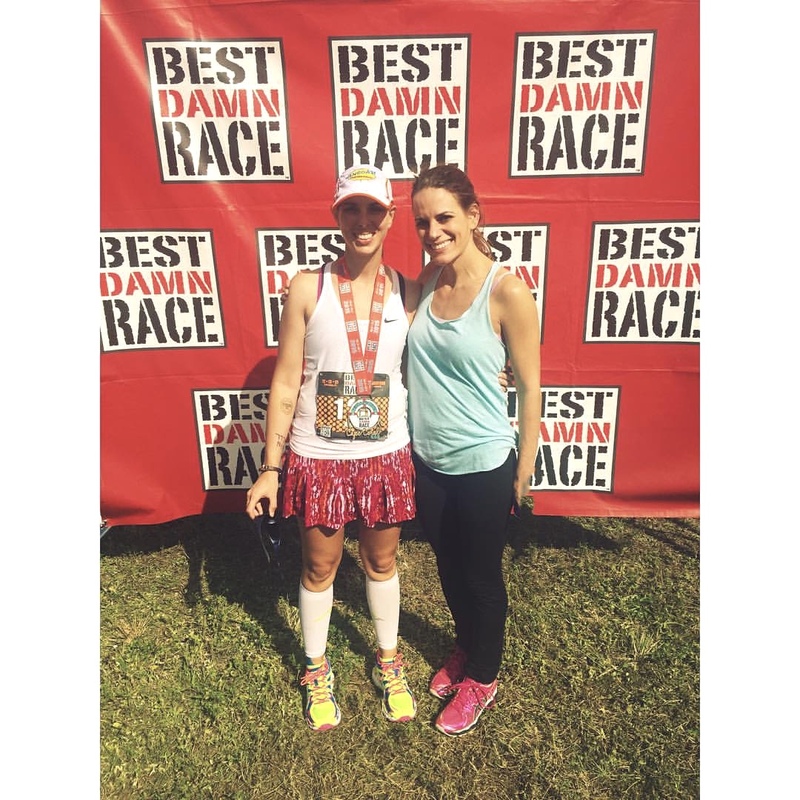 Noteworthy Post: Looking back on my thoughts post-race, after I'd had some time to come to terms with BDR's outcome, I'm really proud of how far I've come as a runner and as a person. 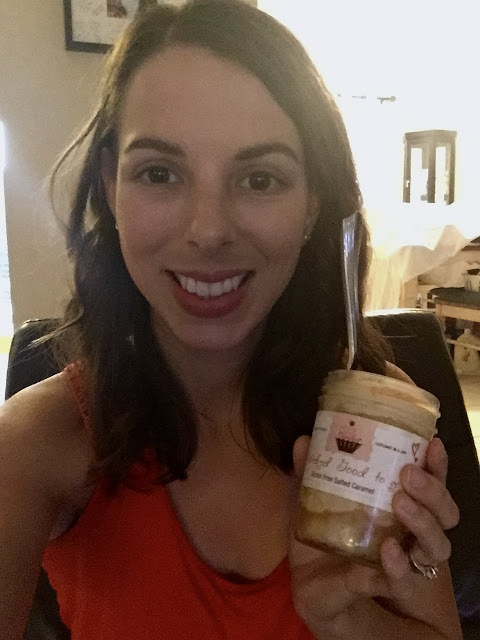 I feel mentally stronger and more confident than ever before, and I think that comes across pretty clearly in how I talk about my successes and setbacks. Looking back, I can see that 2015 was mostly a fairly solid year. I do think this year made me a stronger runner mentally, and physically in some ways, but I lost a lot of speed; at times, I really coasted. 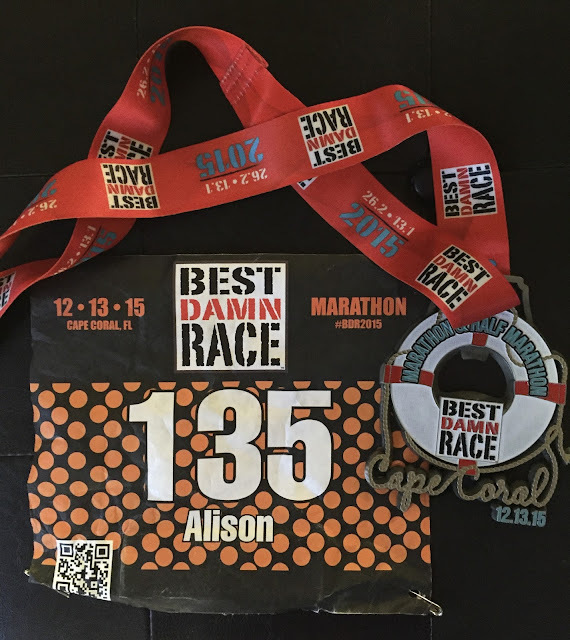 I did find this year that I can knock out a respectable half marathon time without too much training, which made me happy, but I also learned that no matter how prepared I am, sometimes race day conditions will get the best of me. I'm ready to take the lessons I learned from 2015 into the new year and make 2016 a year to celebrate and remember! This year, Matt and I were able to split our time nicely between families for Christmas Eve and Christmas. 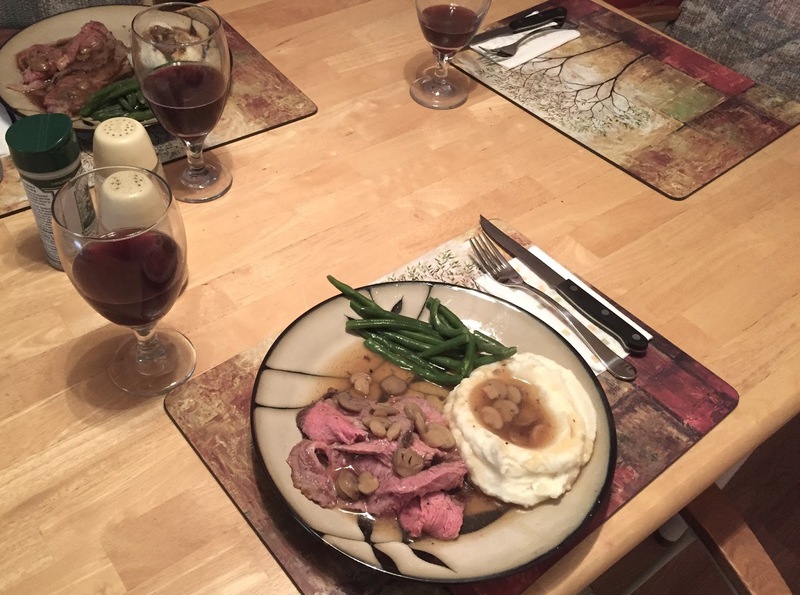 On Christmas Eve, I ran in the morning (the longest I've run since BDR) and then we went to his mom's and helped cook dinner and spent the evening together. I saw lots of deer on my run, and they stood still and made eye-contact with me while I stopped to get pictures. 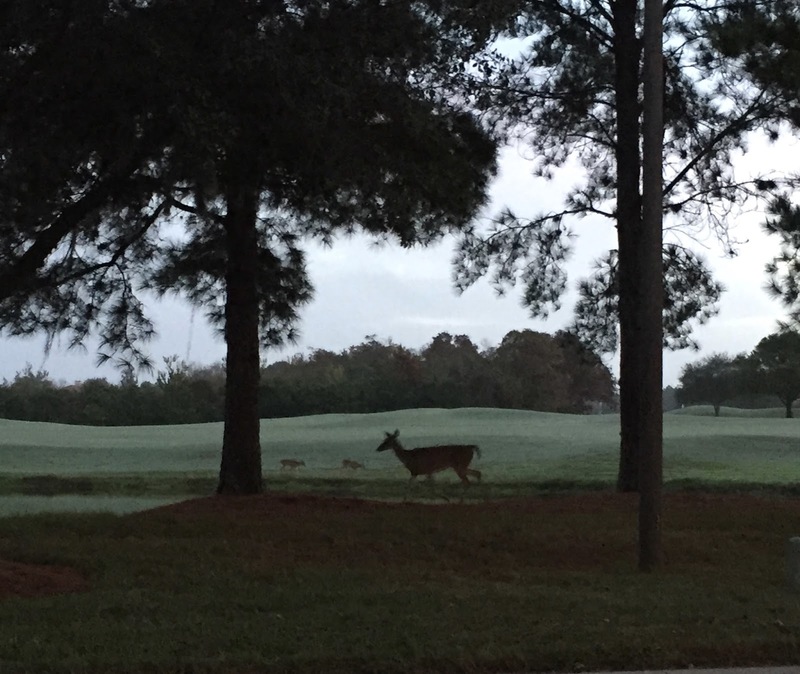 Deer are considerate like that. I enjoyed a nice sunrise and 5 miles. On Christmas, we spent the day with Matt's dad's family and got to see his cousins and Nana. It was a very full (and fulfilling) day. This year, it was clear to me that no one is easier to shop for than runners! We're drawn like magpies to new gadgets and accessories. 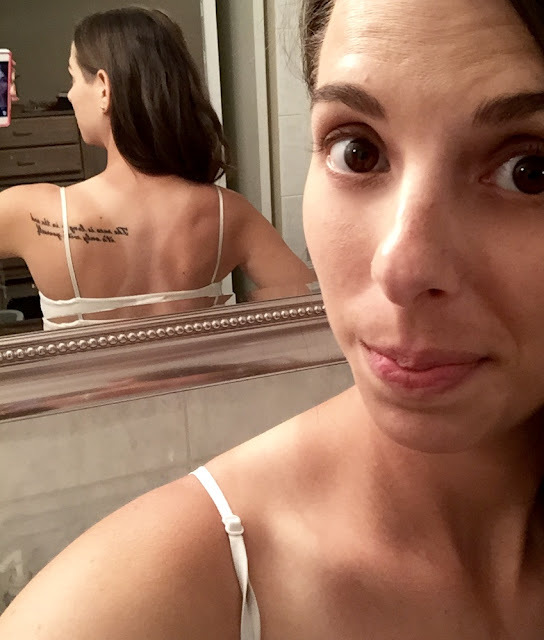 I don't usually make a post about "gifts to get your runner this Christmas" because I feel like the internet is full of them this time of year, but this holiday season, I've received three gifts I really wasn't expecting and already love, so I had to share my delight! 1. The Apple Watch. Now, it's no Garmin, but for me, that's a plus. 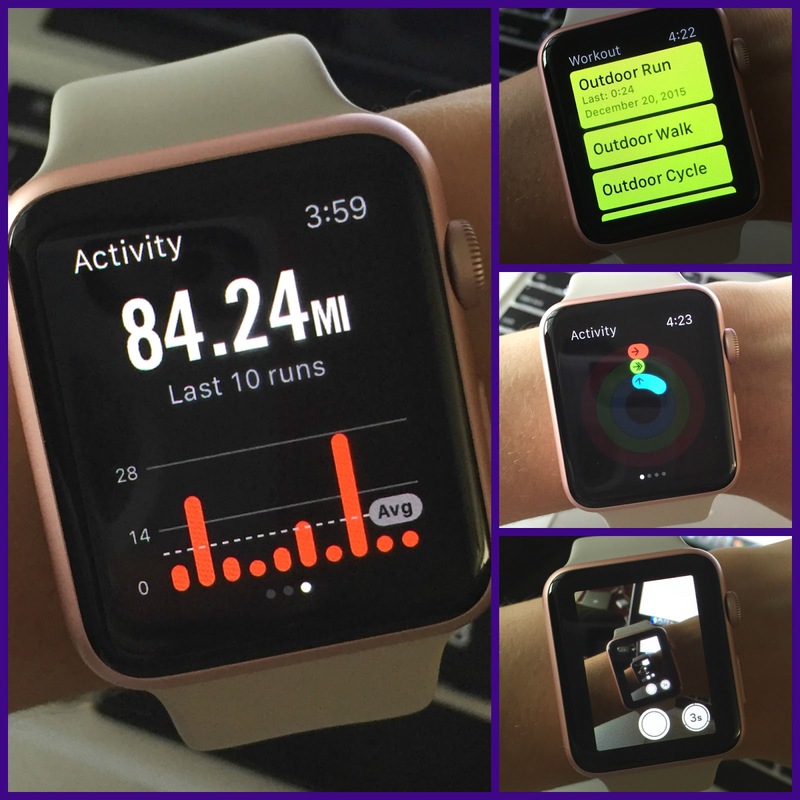 I love that the Apple Watch lets me access my apps and has a workout app of its own. I can dictate texts through it, which is a must for me, and it's so pretty! I've been playing around with the workout app vs. Activity vs. Nike+ via the watch, and all three have their benefits. Yes, that's a picture of a picture of a picture ad infinitum. I love that the Nike+ app lets me track my pace during runs and brings up the cheers as they come through, so I can see who's cheering as I go instead of when I'm finished. The display is easy to read and the watch itself is super easy to use. I also like that I can use the watch as a remote camera, which I know will come in handy once I practice working with it more. 2. The Palm Massager. Steph surprised Matt and me with this mini TENS unit, but Matt is a little skeptical about giving it a try so it's mostly mine for now. When I was in college, I had really bad migraines and used a TENS unit as treatment, so I'm familiar with it and already know how it works for me. I know the effects might be mostly psychological, but who am I to knock the power of placebos? If nothing else, it feels nice to have a little electric-massage after tweaking a muscle. Who's up for a little light electrocution? 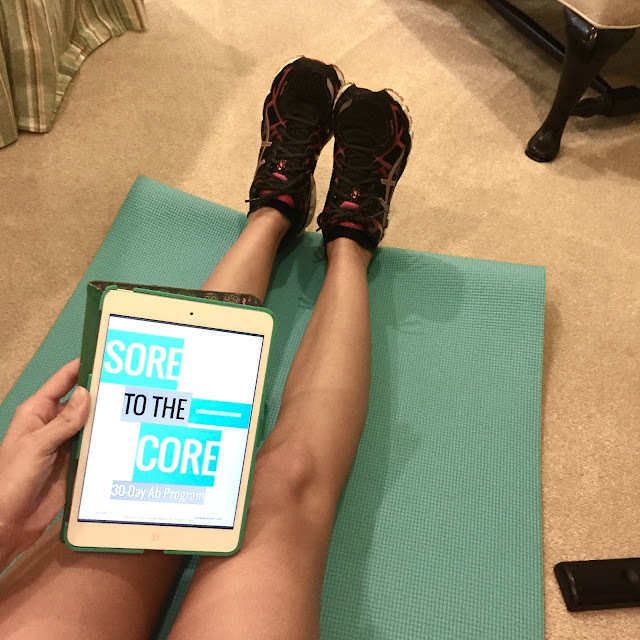 I've started my 30-day cross-training challenge, and Tuesday my back was a little sore from all the core work. After 30 minutes with the Palm Massager, I felt better. Not perfect, but much less stiff! This is definitely a gadget I wouldn't have even thought to get myself, but it's going to become a recovery staple for sure. 3. 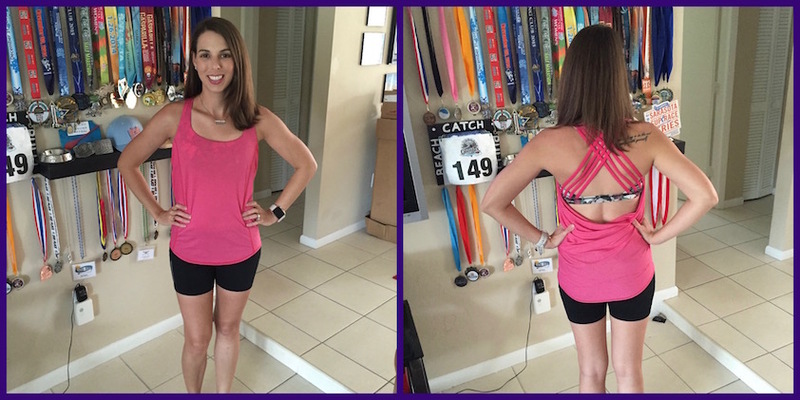 The Lululemon Wild Tank. This was a gift from Kristin and my first piece of Lulu apparel. Kristin owns it in multiple colors and I always comment on it when she wears it; the strappy bra and the low back is just really cute! Most of my running clothes are pretty basic and utilitarian, so it's nice to have something pretty, eye-catching, and fun in my drawer. Lulu isn't something I'd ever splurge on for myself, so I'm especially grateful that Kristin snapped it up for me! I wore it on my Christmas Eve run and during my core workout afterward and it was so comfortable. I received some other wonderful gifts, like a daily running calendar I can't wait to break into on January 1st and some decorative accents for our house, but these are three gifts I wouldn't have thought to get myself and they're fast favorites. I guess my friends/family know me better than I know myself! Did you receive anything surprising this year? What is your favorite kind of gift to receive? Are you a good gift-giver? Admittedly, I'm not great at it. That's why I always include a handwritten card - I work much better in words than gifts sometimes! This led to a bit of a debate in the comments (all very cordial, of course). Most of us were surprised that Negative Nancy was obviously so offended at being warned that she was being passed. Isn't it good etiquette to warn runners that you're passing, especially on a narrow trail? Some runners, however, opined that they never warn that they're passing, especially in a trail race because headphones usually aren't allowed and their upcoming footsteps can be heard clearly. Still others said they only warn that they're passing if there's limited space to do so. A couple said that they cough or purposely make noise to passively warn runners they're coming, but rarely fully announce themselves. Originally, I felt like I warn people when I'm passing 90% of the time. But the more I thought about it, I realized that that's not true. I only warn people if I'm going to have to make a narrow dodge between them, or if they begin to meander into my path at the last minute. Then of course I got to thinking about the fact that announcing rarely works out anyway, since people only have a split second to react, and then this happens. Either way, passing is necessary sometimes, and announcing you're passing isn't meant to be rude. But is it necessary? Negative Nancy may have been having a bad day, or maybe the original "Passing!" comment sounded harsh because some of us tend to shout when we're running without meaning to. (I'm pretty sure I announced at the top of my lungs, "I'm stuffing ice down my shorts!" at BDR last weekend.) 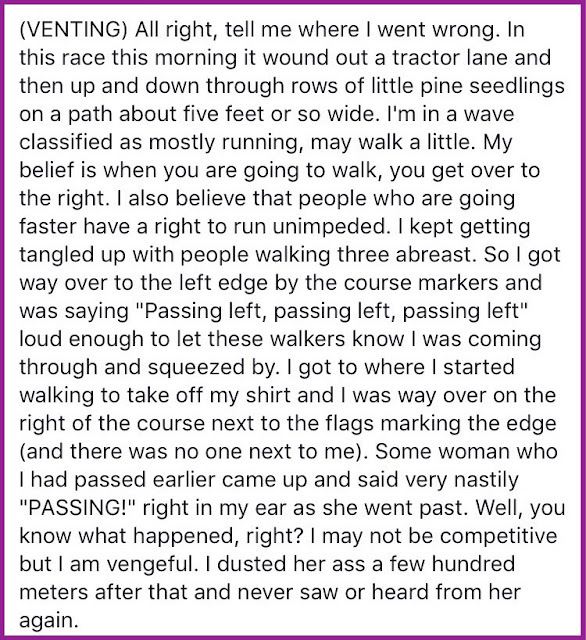 Maybe she was new to trail racing - or racing in general - and didn't know the etiquette; she may have felt singled out. There are many reasons for her overreaction, but the question remains: is announcing that you're passing necessary etiquette, or not? What do you guys think? 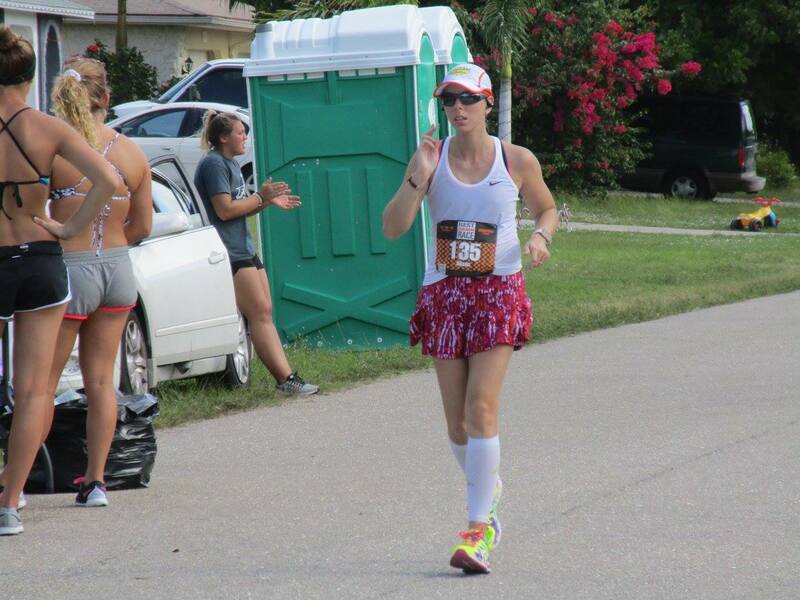 Do you announce when you're passing other runners? Do you prefer to be warned if you're going to be passed? I honestly believe I was prepared for a PR last Sunday. Physically and mentally, I was there. 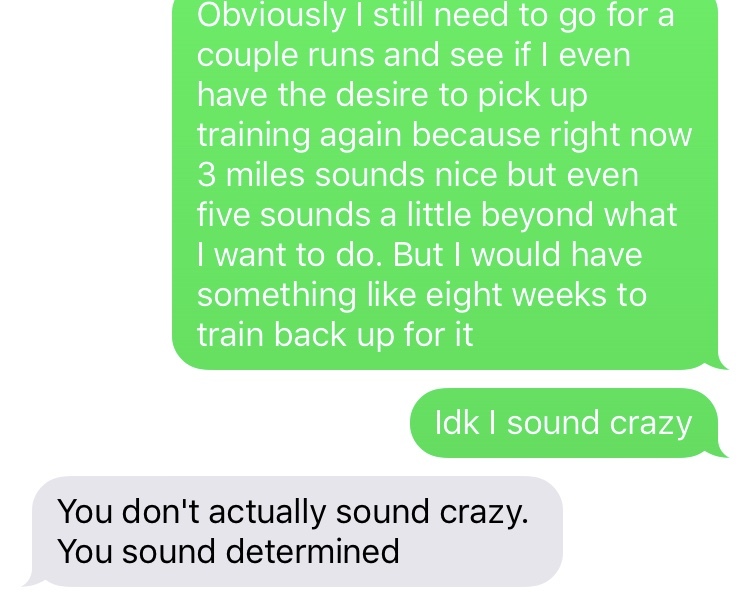 Although I've given the advice to runner-friends, I can't seem to accept that factors outside of my control threw my race day so drastically off track. If I thought there were other major factors, I wouldn't be playing with the idea I have right now at all. I'd be sticking to my "no marathon in 2016" plan. Now that I'm feeling recovered, I can't help this growing need to try again. Soon. But as it stands, I truly feel like I got screwed out of something I worked really hard for not because I wasn't prepared, but because we can't control race day circumstances, no matter how hard we try. The stomach cramps and liquid bowels I had at 16.5 and 23.5? Possibly heat-induced. The inability to fuel correctly? Possibly heat-induced. The need to stop every mile or two to stuff ice in my bra? Definitely heat-induced. For BDR, I set a huge stretch goal and I meant to go for it. 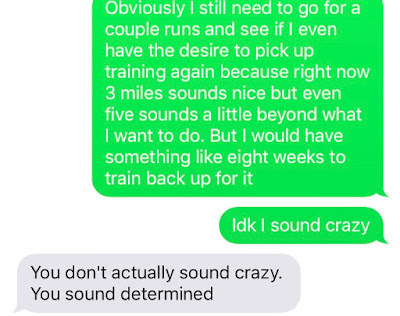 It was a big deal for me that I was honest with you all about my hopes for that race, because in the past my fear falling short has meant I set easier goals so I'd be sure to meet them, and it really sucked to have to write a report that was basically a long, long explanation of my failure. But I think this was good for me. I've now failed, and I'm not dead. I'm not done. I don't feel defeated. If anything, I feel more determined than ever. And I'm no longer afraid of failure...in this regard, at least. I love how quickly her tone shifts from incredulous to practical. I certainly didn't feel this way after Space Coast in 2014; I was all too ready to take time off after that race. But this time, I don't feel I did my training justice. I want another shot. And I think my slow pace made the marathon feel more like a regular long run than a race, so I don't feel physically beat up. This is an example of a reverse-taper plan from Runner's World that I could use to get me back into training in a smart, thoughtful way. The bottom line is that if I turned my A1A half into a full, I'd have about 8 weeks to recover and train up again, which might be easier to do than to start from scratch in 2017. It means that for the rest of 2016, I would still focus entirely on speedwork and short distances, but I could at least have one more go at my marathon goal before eschewing long distance for a year. I've done some research on how to reverse-taper. I've considered that this means I'd need to do another 20-miler (or at least 18) in mid or late January. I'm aware that that might not be realistic and it may be too much too soon; that's why I'm not rushing into any decisions right now. I've gotten advice on both sides of this decision, and I'm taking my time weighing my options. No matter what, I'm lining up at A1A. Depending on how things feel, I may choose to upgrade to the marathon. If I do, it will mean I honestly felt like I was able to recover and return to training in a smart, safe way; if I don't, I won't be running a marathon in 2016. I'm not disappointed in myself regarding BDR, but I'm frustrated with the situation. So, I'm not rushing this decision. But I'm definitely considering it. How quickly have you jumped back into training after a huge race? I had this same conversation with multiple students throughout the day Tuesday, after I'd returned to school. Student: How was your marathon? Me: (still not sure how to answer this in one sentence) It was really hard, but it was good. Student: How far was it? Me: A marathon is always 26.2 miles. Student: (aghast) You ran 26.2 miles Sunday and you're at school today?! How long did it take you? Student: Wow! I can barely run a mile! Aren't you sore? Me: A little. That's why I took Monday off. But I feel pretty good today. And then I realized...marathoners may know my time isn't stellar, and I may know I missed my goals, but I'm not trying to impress anyone. I'm just trying to be true to myself; my students often remind me that it takes courage even to begin, let alone to finish, no matter the result. Finishing 26.2 miles is an accomplishment, no matter how long it takes, and I've done it twice. 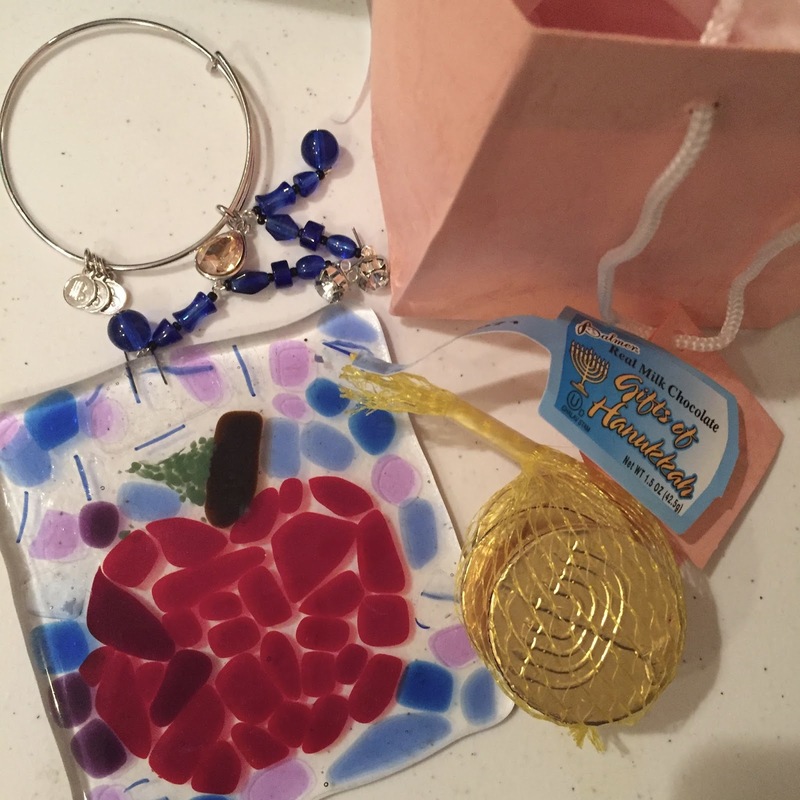 Speaking of the kids, I've received some very sweet gifts this year, some handmade!, but my favorite may be the Hanukkah gelt. The boy who gave it to me kind of snuck it into my hand and said, "Happy belated Hanukkah, Mrs. Kearney." So thoughtful! Recovery this week has meant enjoying some TLC. I had a massage Monday, courtesy of Kristin! It was just what I needed and super luxurious...Truth be told, I felt pretty intimidated, but next time I'll be brave and try out the sauna and steam-room. 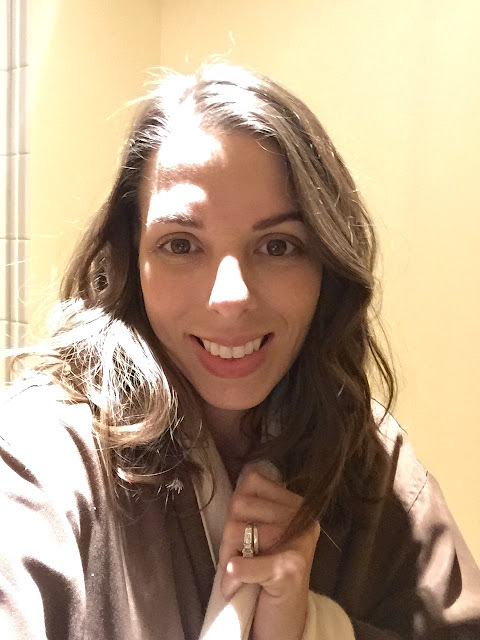 Mmm, the spa had comfy robes and everything! I got chocolate-chocolate, vanilla, salted caramel, and chocolate-vanilla. Yum! Yes, I got this tan line in December. DECEMBER! 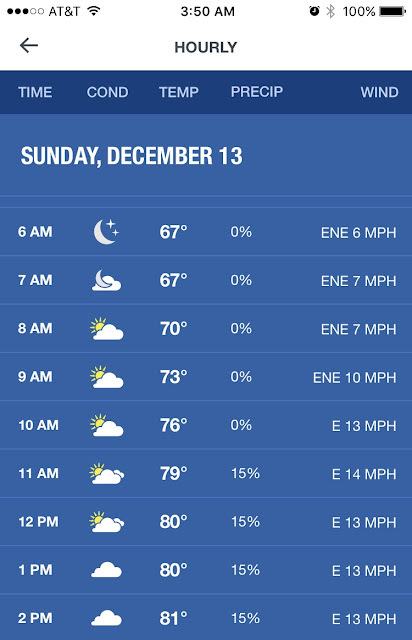 In other news, the cold I usually get during taper was kind enough to wait until after race day to kick in, luckily. I'm officially losing my voice and getting all kinds of sinus headaches. I only have one day left until winter break, so I know I can make it. I'm also absolutely exhausted. My legs feel so ready to run this week, but my body is in total recovery mode. I've gone to bed super early every night this week, and I honestly can't wait to sleep all I want on Saturday; maybe I'll have a little run Saturday or Sunday evening. I feel ready for it! So that's it. I'm lying low, relaxing as best I can, and chipping away at school stuff (lots of grades and parent meetings before break). Break is so close I can taste it! How do you celebrate/recover after a big race? What's the most thoughtful gift you've ever gotten from a student or friend? Grab a snack and settle in - this is a long one. Today, I'm at a loss. How do you respond to the question, "How was the race?" for a race like this? It's complicated. It was really, really hard, but I feel gratified. I struggled, but I overcame. I cried, but I was mostly happy. I hated it, but I loved it. 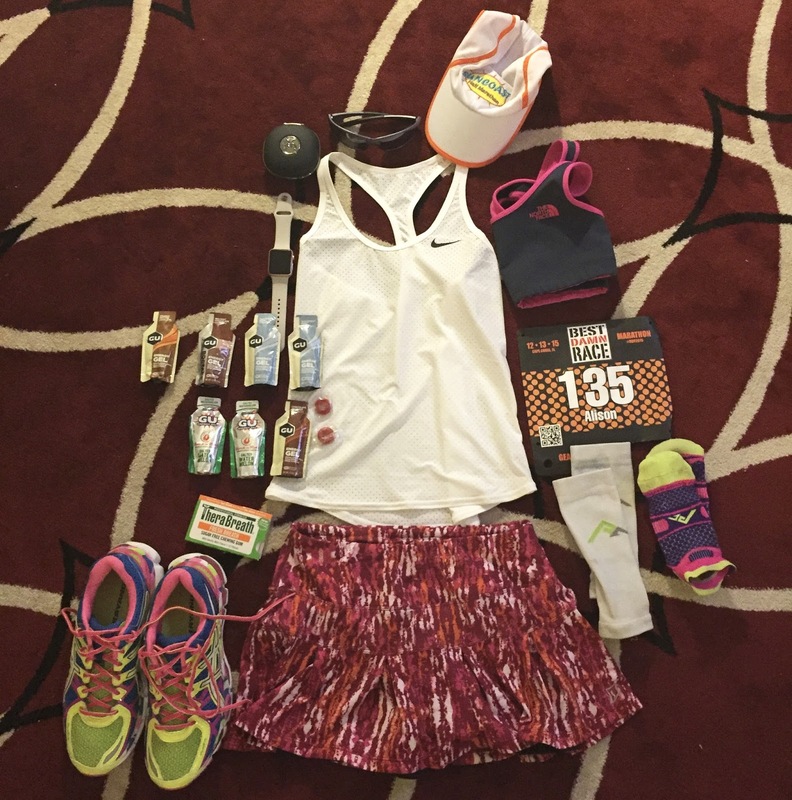 Can you ever put into words the marathon experience for those who weren't there? I don't really know where to start with this recap. In a way, I don't even feel the race happened. I spent so much time training and thinking over every aspect of race day, and now that it's passed, it seems impossible that it's over! But, it is! Race weekend has come and gone, and it was bittersweet. Those of you on my Facebook and Instagram already know the condensed version of the story, which is that I not only missed my A, B, and C goals, but I came in 10 minutes slower than my first marathon last year! Still, I can't seem to feel bad about it. I finished another marathon, it was more emotionally grueling than any race I've ever done, and I truly know that I trained the best I could and went in as prepared as I could be. Race day is often unpredictable, and there are always uncontrollable elements that we need to work through as best we can. In the end, I'm proud of my training and my strength, and although I didn't meet my goals, I know that everything I could control and prepare for, I did correctly. And I can't ask for much more than that. I was expecting to pick Megan up from the airport around noon, but her flight was delayed due to fog. Her new landing time was supposed to be around 2pm, so I made a trip to the running store to pick up Gu. While there, I decided to go on a hunt for a white tank top for race day. I knew by then that the weather would be hot and sunny, and I couldn't wear the dark tank I'd been planning on if I really wanted to be smart. At 1:30, Megan called; she had landed early! I quickly paid for my tank - luckily I found one in a similar style to a tank top I already own so I knew it wouldn't cause chafing or issues - and went to get her. After some confusion about where she was waiting for me, we finally met! I recognized her immediately - she looks and sounds just like she does on her blog/vlog! We drove back to my house and picked up Matt, then headed to the expo. The race expo was really small and cute. 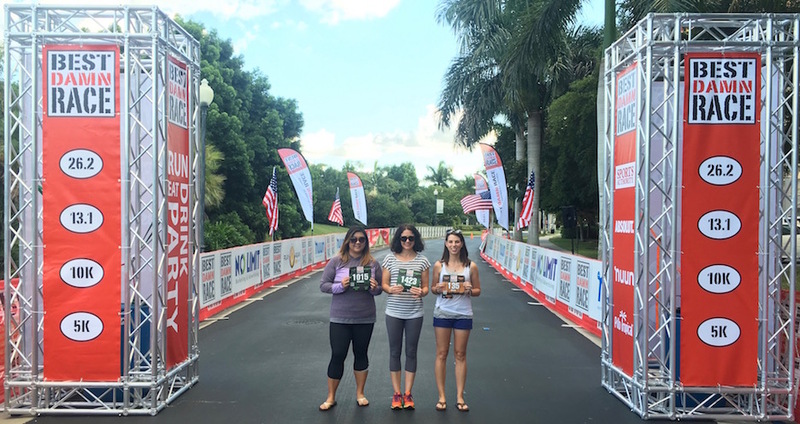 We had time to wander around a bit and check out the start line before Kristina met us. We figured out logistics for the next day, took a couple pictures, and went our separate ways. 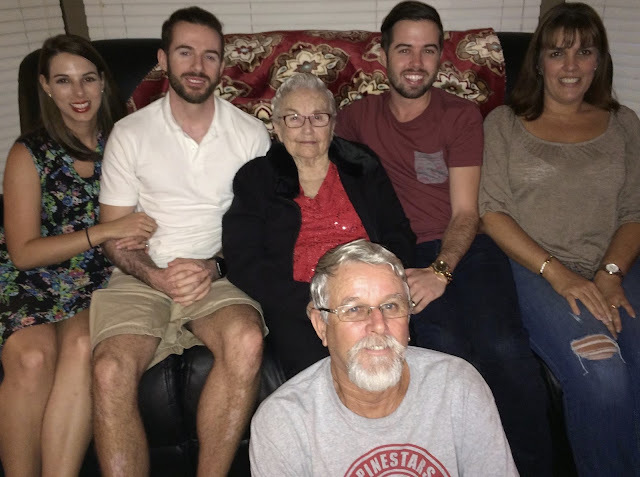 After stopping at Publix to pick up fixings for dinner, we arrived back at home just in time to meet my sister. 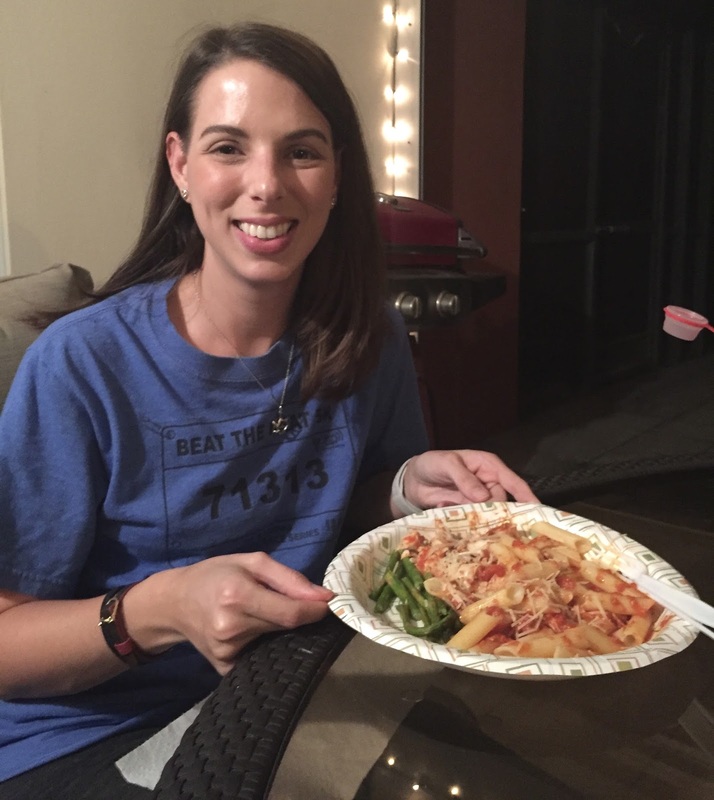 We pretty much cooked immediately and had a nice, family-style dinner before putting together our race day things (Steph helped me put on some temporary tattoos she got me for the occasion) and going to bed early. Asparagus, pasta, and chicken for dinner! 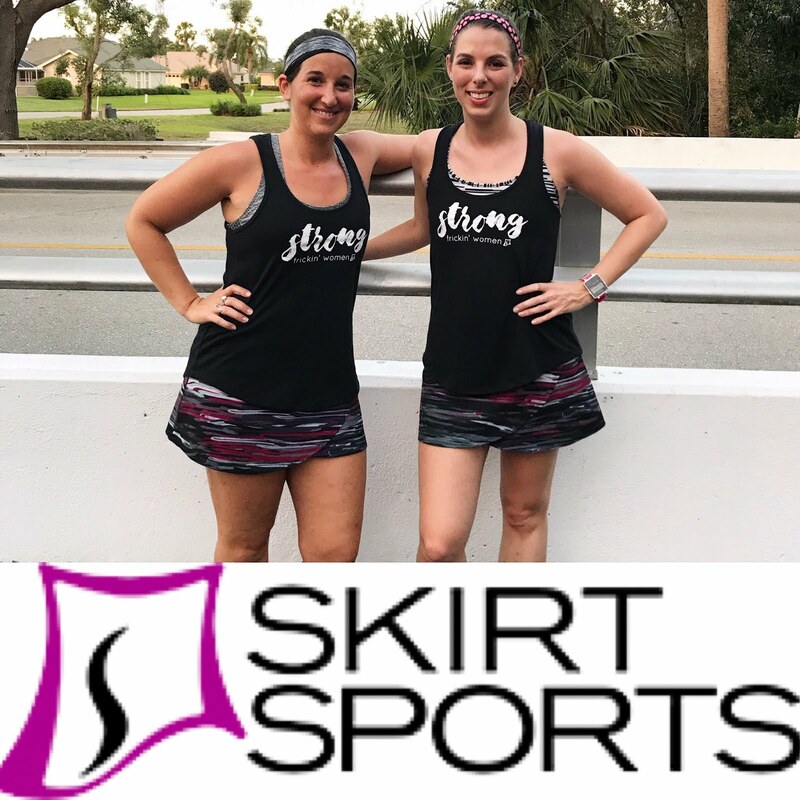 Flat-Ali: Nike dri-fit tank, North Face Bounce-b-Gone sports bra, Pro Compression calf sleeves, Pro Compression PC Runners, Apple Watch, Jaybird blu-tooth headphones, Sport Skirts lioness skirt, Asics Kayano-21. The smell of coffee woke me up before my alarm, which was the plan. I made myself a cup and sat in bed from 3:40 to until 4:10, obsessively checking the weather, and finally woke Matt. Because I only live about 25 minutes from the race venue, the idea was to leave just before 5am and have plenty of time to park, use the bathroom, and relax before the race began at 6:45. "Partially cloudy" was mostly a lie, but those wind speeds were pretty accurate. So were the high temperatures - it got up at 83 by the time I was at mile 19. Everyone was up and ready to go on time. I ate my oatmeal in the car. We stopped to grab a bag of ice so Matt and Steph could hand it out along the course when I saw them. RIP neon green 404 hat...more on that later. 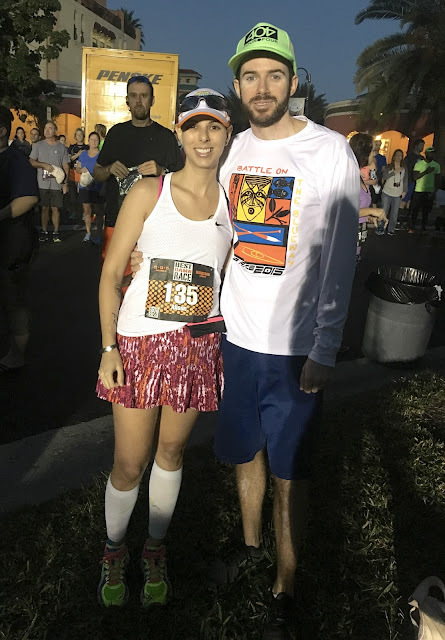 At the start of the race, we found Kristina and Sean and had time to use the toilets before lining up. I found some colleagues of mine at the back of the corrals (one of them was running the half injured so they were planning to go slowly) and wished them luck before joining Kristina for the start. Within the first mile, I already felt warm. It was 67 at the start, but the late start time meant the sun was already rising, so the temperatures climbed quickly. I put in my headphones early on (I was going to avoid that and just check my pace on my Apple watch, but I had messed with the settings earlier and couldn't get Nike+ to work on it, so I put the headphones in to track my pace) and listened to Heather Dubrow's World Podcast. Kristina and I cross the start line! My first few miles felt nice and easy, but my pace (which I wanted to keep between 12:30 and 12:40) was in the low 12s. I tried to slow down, but that seemed to hurt a little, so I just went with it. My left knee hurt a little at mile 4, but then felt fine. For the first half of the first loop, I felt good, confident, and strong. That changed quickly, though. I was surprised by how early on I hit my wall. I had eaten a Gu about 20 minutes before the race began. Then I ate one at mile 5. I ate another at mile 10...and from that point on I wanted literally nothing to do with food or drinks. The heat was starting to make me feel bloated and full, and the wind was making it really hard to breathe. Coming up on mile 9. I saw Matt and Steph at mile 9ish and stuffed ice down my shirt. By then, I had lost motivation to even finish the race. I felt awful. There was a moment that I wondered if I'd really get it done; finishing at the 13-mile mark was really tempting. Still, I made it through the first loop. Despite my struggle, I was still keeping good paces. I had an orange slice at mile 13 and that seemed to help. I saw the 3:00 half pacer, who's in the Sub-30 Club, and shouted a greeting. I waved at Kristina as we passed each other. I waved at my colleagues. Seeing familiar faces on the course was a nice boost. At mile 14 I saw Matt and Steph and ate more ice; Matt told me a girl had asked him for his hat, because that's how hot it was. He gave it to her. I told them I was really struggling and had no motivation, that I knew my PR was long gone, but that I'd get the race done one way or another. It was really, really hard, guys. 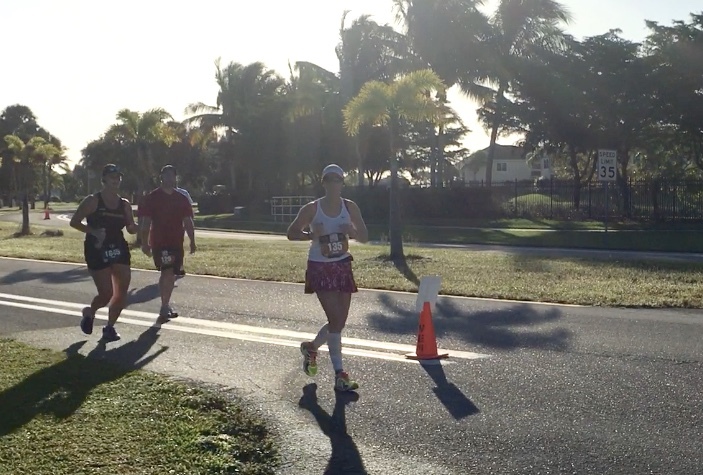 I remember feeling my worst at mile 16.5, and my splits support that. I had sudden stomach cramps and literally thought I was in danger of an emergency bathroom situation. I doubled over, took my inhaler, and just let myself sulk for a minute. Then, I got back on the course. By mile 18, I was beginning to feel better. Tiny little clouds began to dot the sky, and those little breaks from direct sunlight made a huge difference. 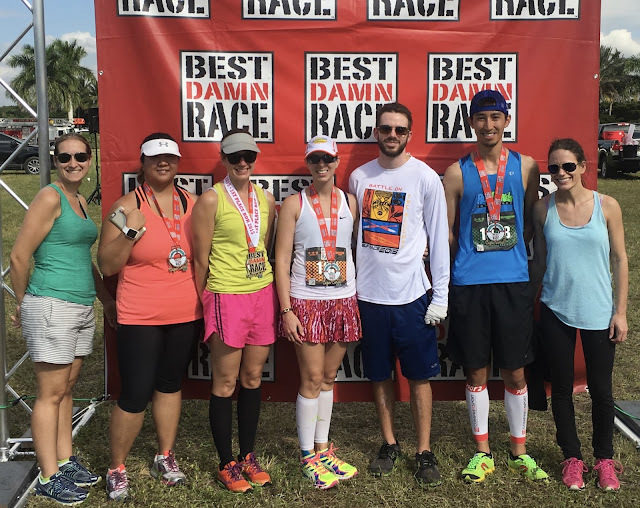 I convinced myself to just shuffle along as best I could; at this point I was disappointed in how much I had walked, and I was really emotional, but I was determined to salvage the race as best I could. 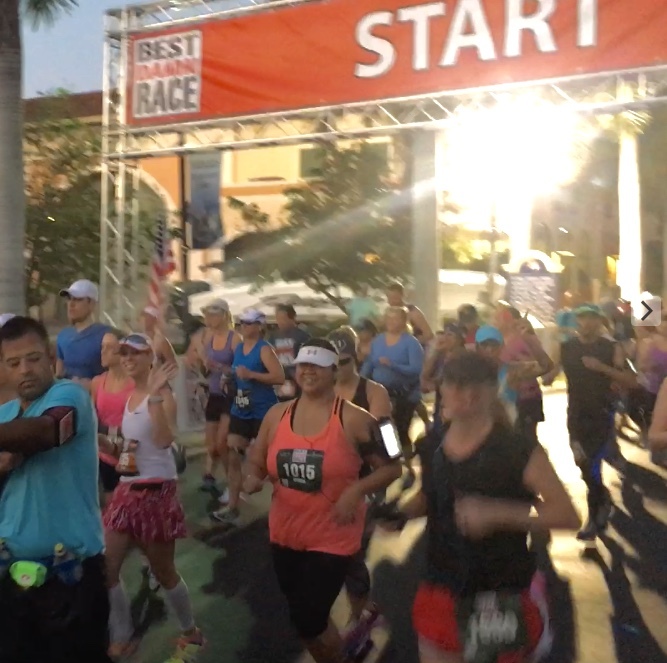 I began to keep a steady running pace; I passed quite a few marathoners who had begun to walk. I tucked my head down to block the wind and just kept chugging. 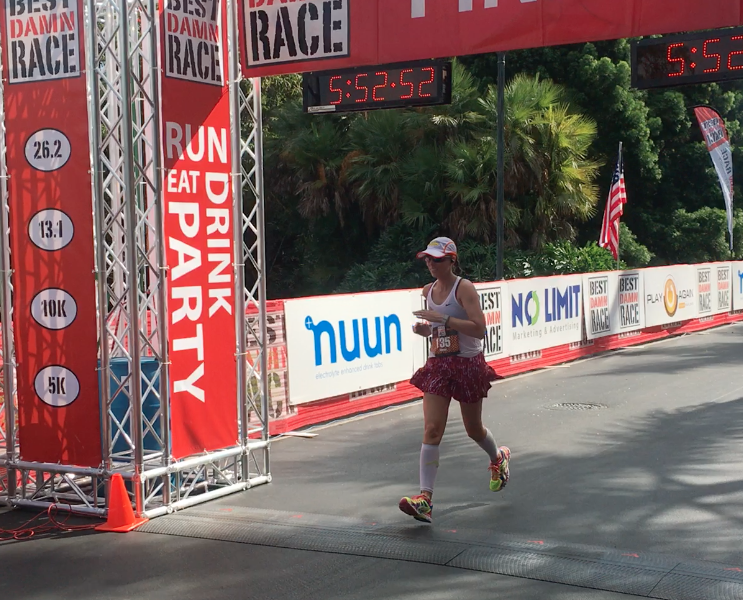 At mile 19, I saw Kristin. She had parked near a turn-around and had a smorgasbord of food and drinks; I gulped down some Coke and it was the best thing ever. She ran about a quarter mile with me and pointed me in the direction of Matt and Steph, who were at mile 20. I continued to feel better. The dark part of the race slipped away. At 20, I shed all my Gu and extra pockets and told Matt and Steph to go straight to 24 (they were going to go to 22, but I just wanted to dig in and get it done without anymore distractions). Miles 20-23 were tough, but mostly okay...if that makes sense. I was back in neighborhoods with no shade and no breeze, but I was kind of in the zone. I experienced another awful intestinal cramp (I never got these in training!) just before Kristin showed up at mile 23.5 with a cup of ice water. I asked her to tell me stories while she ran with me a bit, and again she told me, "Matt's just ahead at 24!" and left me for the finish. Mile 24...check out the ambience haha. 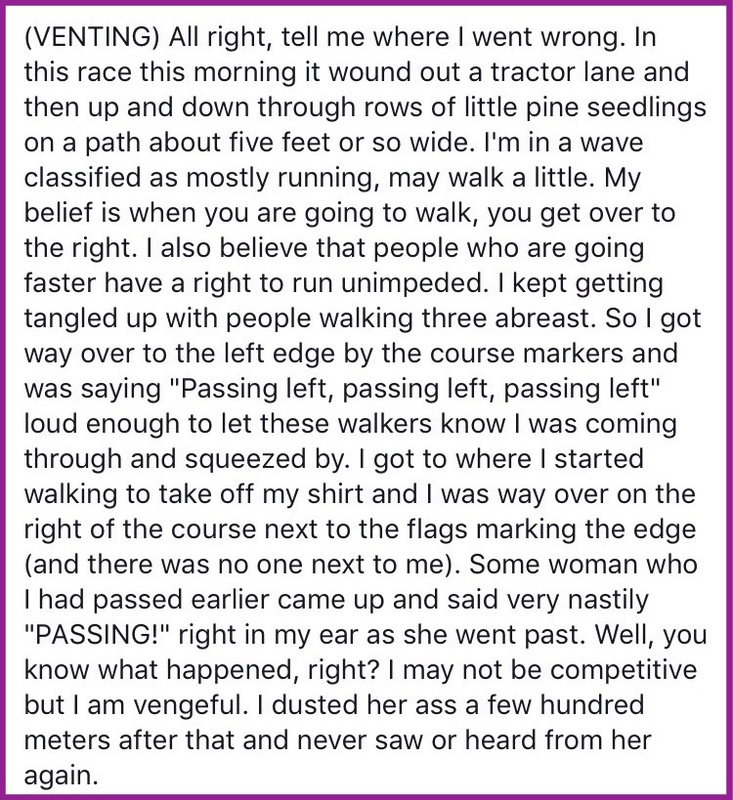 Just short of mile 24, a woman who lived on the course tried to flag me down to ask me a question (probably about when the race would be over/roads would open) and I kind of snapped at her. "I'm nearly done, I'm not stopping to talk!" I shouted. I feel bad about it today! At 24, I saw Megan, Kristina, Matt, and Steph all there cheering for me with ice and smiles. They told me I looked really good, that everyone else coming through was walking, that I looked strong...and I was seriously unable to speak because I wanted to cry so badly. 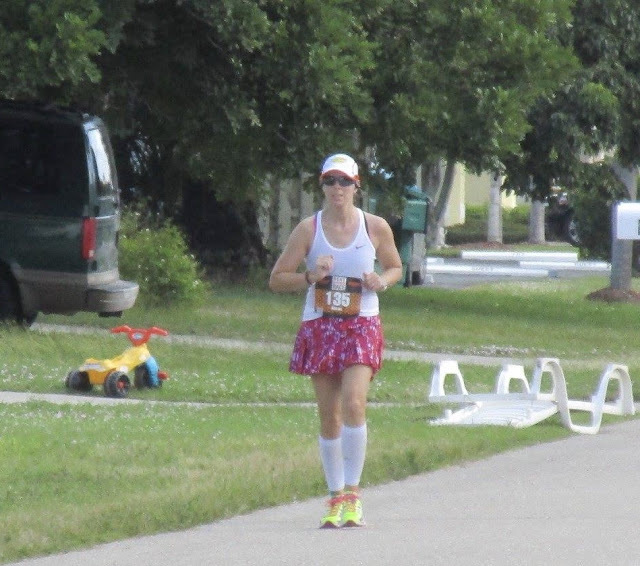 I wanted to tell them that I was confused about my pace and my time and the course length but all I could say was, "I'm too emotional to talk; see you at the finish." 27?! Seriously?! Sean's GPS was right at 13.1, but Megan's and Kristina's were both long, so I'm attributing the extra distance to not running the tangents and stepping off course for ice. At mile 25, I realized my GPS was tracking long (because it told me I was done!) and, dejected, took another walk break. An absolute angel driving by handed me a water (I saw she was wearing her medal) and I poured it all over myself. At this point, I began talking to myself. "You did it. You're going to finish another marathon. This was hard, but you did it. Keep going. Just get it done." At 26 miles, I saw Sean waiting for me. He began running with me, coaching me along. "Just one more turn and a little sprint!" Again, I felt tears welling up. All alone in the finishing chute. And then I saw the finishing banner. I was the only one in the chute. Sean peeled off behind the barricades as I went, picking up speed as I saw my cheering section. I managed to finish with a smile. My official time was 5:51:50. More than 30 minutes off from my A goal; more than 20 minutes off from my B goal; more than 10 minutes off from my C goal/PR. Ten minutes slower than my first marathon. I wasn't sure what to feel. I was extremely confused about the length of the course and my pace according to GPS...According to it, I was on track and doing 12:30 miles the entire race. How had I lost so much time? Was it human error? Was my math off? Finishers! Sean secured the PR he was aiming for and Megan placed first in her age group! As I sat on the ground thinking about this, the rest of the group gathered. My sister threw her arms around my shoulders, and I decided I was really happy with the race after all. I had the most amazing support I could ever wish for, just seriously wonderful and loving people there at the finish, and I was too elated to be done to really care that I had failed. Having Stephie there was a major perk. I hobbled back to the staging area and we took photos. After Kristin and Sean left, the rest of us came back home to shower, then went to lunch. 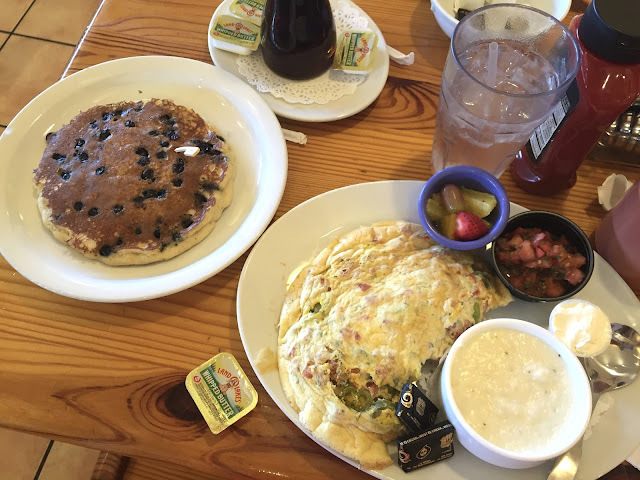 (I wanted brunch but Skillets was closed, so we had Jason's Deli, which was a nice compromise.) We saw Steph and Kristina off and then spent the afternoon napping, hanging out, and eating. It was a good evening. This year I was hungry enough after the race to eat half my Reuben...last year I ate three bites of tacos and called it quits. I figured out the discrepancy in my pace and finishing time...I accidentally had "auto pause" enabled on my GPS. So, while my running paces were on track, the times I stopped to use my inhaler and stuff ice in my bra ended up adding up. That was my mistake - pure human error. Still, my time spent moving was directly on track for the vast majority of the race, so I'm happy with that; next time I plan my goal paces, I'll keep in mind that sometimes I need to fully stop - either for a bathroom break, or for medicine. Finally, Skillets! I had a GF blueberry pancake and a southwestern omelet with grits! Because Megan had a slightly later flight, and because we weren't able to get my dream meal Sunday, we went out to brunch at Skillets before I dropped her at the airport. This morning, my left IT band hurt pretty badly, but Kristin generously gifted me with a massage, and that took care of the worst of it. 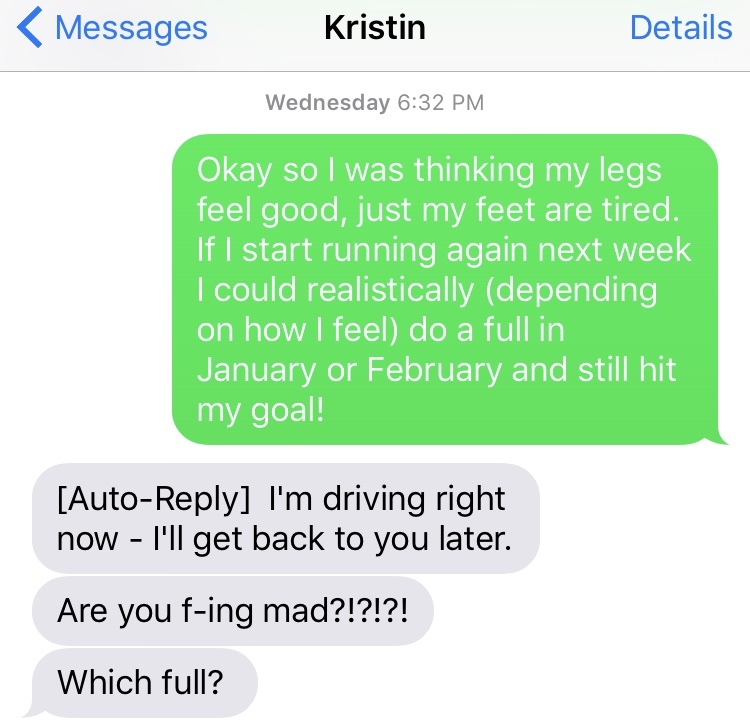 I'm planning to take at least a week off from running, and my plans for the rest of this month are mostly to work on cross-training and easy runs only. 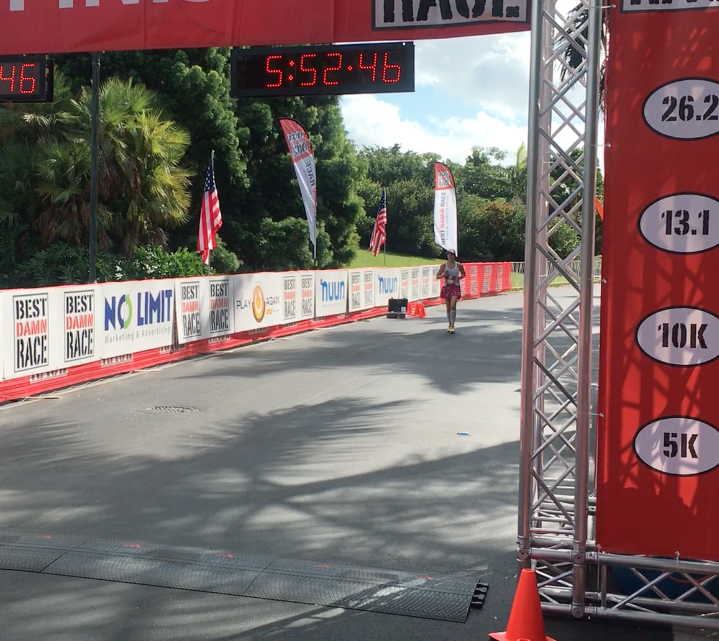 This race was much harder than Space Coast. I didn't realize until Sunday how lucky I was to have such an "easy" (by comparison) first marathon. Even though I had a great training cycle and was mentally totally ready for it (the lack of spectators and quiet/repetitive route never bothered me), the weather destroyed me. There's nothing I could do about that. 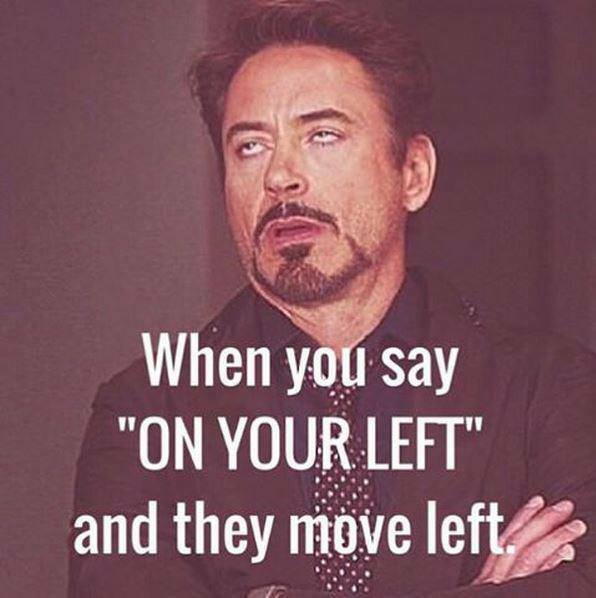 I know it sounds like an excuse; non-runners especially may hear that and think it's a copout. But I know, and those who ran the race know, that the weather was a huge factor. It was brutal. Not only was it hotter than last year's marathon, but it was windier and had less cloud coverage. The race began 45 minutes later than last year's, so we were running in the sun from the very first mile. Other than practicing training runs in the sun, I couldn't have done anything else to prep for the mid-December heat wave...I know you northerners are really happy about running in shorts in December, but we in Florida are hating it. I'm mostly proud of myself. I ran a smart race. I finished upright, running, and uninjured. I pushed myself to limits I haven't faced before. I trained really, really well. I conquered 26.2 miles (or more) for a second time. I'm disappointed, but mostly I'm just proud. My walking pace was in the 18s, but when I was running I was moving along well, even later in the race. So again, I need to account for walking/pausing time when I plan my next marathon's goals. I know that failing is part of the process. Without failure, there is no learning, and without learning, there is no growth. Maybe you'll think I should be more down on myself for falling short, but I can't seem to care that much because in the great scheme of things, this is just one race and I know I'll have a chance to conquer my goals again in the future. 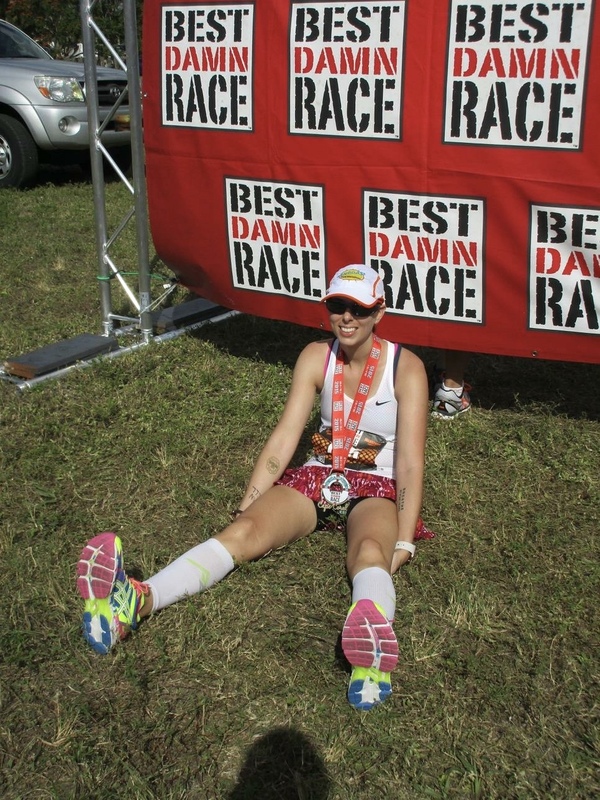 Thinking about last year, my random calf cramps seemed to be my kryptonite. This year, it was the weather. What I've learned is that 26.2 miles is a long way to go, and it leaves room for a lot of unexpected things to happen. So next time (in 2017 - I'm still not planning a marathon for next year), I'm going to need to prepare for the unexpected, and set more realistic expectations based on unforeseen circumstances. I am so glad that Megan decided to fly down and do this race. It was so fun to have her here, and I feel like her being here gave the weekend an extra element of fun and wonder. I hope we made her first-ever trip to Florida something really memorable! I don't think it can be said enough that having people there for you to cheer and support during such a big race is a huge, huge deal, and my support crew is honestly the best out there - they drove to any point, brought anything I wanted, said all the right things, and saw me at the finish. That makes a huge difference in motivation when you're in the last couple miles of a marathon, and I absolutely don't take it for granted.